Join Hawaiian surfer/scientist Cliff Kapono on a journey of enlightenment in hopes of discovering how we surfers can minimize our harmful impact on the planet. Across the world, over 400,000 surfboards are created each year. A majority of these surfboards are made with highly toxic, non-reusable materials that end up in landfills and natural waterways. 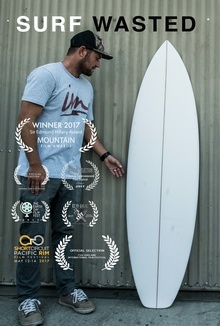 Join Hawaiian surfer/scientist Cliff Kapono on a journey of enlightenment in hopes of discovering how we surfers can minimize our harmful impact on the planet.